Are you currently looking for a cooling solution in your home or commercial property? Contact the experienced team at Chillmech Limited to find yours today! two profiles were found for Chillmech.co.uk in social networks. Among other social networks the website is represented in Facebook and Twitter. 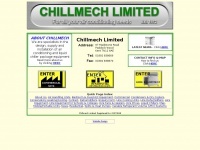 The web server used by Chillmech.co.uk is run by EdgeCast Networks and located in USA. There are many websites run by this web server. The operator uses this server for many hosting clients. In total there are at least 1,055 websites on this server. The language of these websites is mostly english.